Chasing Rainbows- 4 Br/2 Ba Cabin Featuring The Private Sleeping Cottage, Sat TV, WIFI, Gas Log Fireplace, Pet Friendly, Hot Tub, Jetted Tub, Gas Grill, Paved Access, Foosball, Sleeps 10, Starting At $150 A Night! Chasing Rainbows is our warm and inviting cabin home, located in a quiet private community only 15 minutes from downtown Blue Ridge. If you are looking for privacy and seclusion without the hassle of driving, this is your destination. 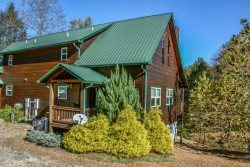 The cabin is located on 2.5 acres of wooded mountain-side acreage with all paved roads, driveway and parking, along with a gated lockable entry. The 3 bedroom/2 bath two story main cabin sleeps 7 with the master on the main floor that includes a king size bed and jetted bath tub. The upstairs has 2 bedrooms with a joining bath and a loft game area. The living area has a rock stacked gas log fireplace with a 55-inch TV over the mantle. Dish Network, WiFi, and a DVD player with many DVD movies are available for your enjoyment. A flat screen TV is also located in the loft with XBOX/DVD player, games, foosball and movies. "The Cottage", private sleeping cottage, is located aside from the main cabin featuring a bunk bed, two chairs, and Flat Screen TV with Xbox. The perfect place for the kids to relax during your mountain vacation! For dining, enjoy the fully furnished kitchen with Keurig and the two dining areas that seat up to 10. Outside cooking is provided on a propane grill located on the side porch. To un-wind after a big meal, enjoy the remainder of the day by swinging or rocking on the large wrap-around porch or by taking advantage of the beverage center. On cool nights, break the chill by sitting around a camp fire or a flickering chiminea. Gaming enthusiasts can set up the corn hole boards, poker table, or select a game from the loft library. For you romantics, nothing beats soaking in the hot tub and gazing up at the heavens on a starry night. If you're more the gambling type, you are only a short 30 minute drive to the brand new Harrah's Cherokee Casino in Murphy, NC. Whether you are looking for a romantic getaway, a family gathering, watching the big game, or simply unwinding after a full day of fishing, shopping, or site seeing, Chasing Rainbows is your cabin destination! Stayed at Chasing Rainbows. Lovely cabin and facilities. Family enjoyed our four night stay. Mountain Laurel staff was very kind, helpful, and responsive. Only challenge was there was no internet service Apparently the service provider had a problem in the area and never got it fixed during our stay. Your cabin is beautiful, clean, spacious and so comfortable. It has all the comforts of home and my family and I can not wait to book our next stay. We had a great time. Well stocked, easy to get to. Just all around great time. Our stay at the cabin was great. The cabin was clean and well maintained. Chasing Rainbows made a wonderful extended Christmas/Friendsmas. The Christmas tree and holiday trimmings were a nice suprise as we did plan on having a Christmas season. Hannah and the bulldog enjoyed the fenced yard very much!! Can not wait to come back!! Thank you soooo much! The goal of our trip was to let go of the city and relax. You guys have madeus feel so welcome!! This was our very first cabin trip and not only did we decide to make this an annual trip but we would love to do it here. We felt so at home we didnt want to leave!! Thank you again for everything! This was our second year visiting Chasing Rainbows and we love it! This cabin is full of so many homey touches that have made our vacation extra special! We can't wait to visit again-maybe in the summer. Enjoyed this cabin more than we ever expected. Such a gergeous cabin, none of us want to leave but that just means we have to come back. Thank you!! We loved staying at Chasing Rainbows. Such a comfy and lovely cabin. We enjoyed all the amenities!! Everything we could need or want was here. Our boys loved the hot tub and "club house" (cottage). We loved hanging out on the porch and at the fire pit. We will definitely be back again!! Thank you so much!!! What a wonderful cabin with such modern amenities! You offer every kitchen tool and appliance we needed and more! My runs and exploring the area around the cabin were peaceful. My son enjoyed the hot tub and xbox. Thanik you!! Thanks for letting us share your wonderful "cabin in the woods!" My husband and I enjoyed the peacefulness and beauty of nature all around us. Our first visit to this area will not be our last God willing! And , yes, we did see a rainbow!! Can we stay here forever???? We loved this cabin! Even my 4 year old said "this cabin is a beautiful cabin!" Our favorite so far! Thank you for everything! Had a relaxing visit with our children's families. Love the homey atmosphere! We have stayed in several other cabins in the area and this is by far our favorite! We love the special added features like the fenced yard! Makes it easier for our daughter and dog to play outside, The toys upstairs were another added bonus. We've never been to a cabin with such nice appliances, a quesodilla maker?! They were yum!! Our pancakes tasted great from the electronic skilltet/griddle. We love visiting Blue Ridge area/town is great and my husband love the fly-fishing in the area. We come up here several times a year and will definitly be back here!! Thank you Chasing Rainbows we loved our stay! It was perfect vacation for our family! We WILL be back. Thank you for having us at Chasing Rainbows! We enjoyed our stay very much. Loved all the little details and suprises throughout the cabin. The cabin exceeded our expectations Very clean :) We enjoyed the charm of downtown Blue Ridge. Thank you for providing such a wonderful home to enjoy our Thanksgiving in. We absolutely loved this cabin- it is beautiful and cozy and everything a cabin is in our dreams. Thank you for the wonderful weekend getaway!! The cabin is beautiful with wonderful amenities. Our fur babies loved the back yard. Very quiet and a really great time here. This was a very nice cabin easy to get to. We really enjoyed it. The cabin had everything we needed and the decorations made the place feel very homey. The gated area was perfect for our dog to run around safely. Thank you!